So I may be letting the cat out of the bag early, and if I am I apologize to the folks at GolfPigeon, but Michael Thompson's official website (michaelthompsongolf.com) is now serving live web pages! A screen capture of the home page is shown above. The site is run by GolfPigeon.com and has been in the works for a while. My guess is that they haven't had their official launch yet since I haven't seen a Tweet or other announcement from either Michael or Golf Pigeon. 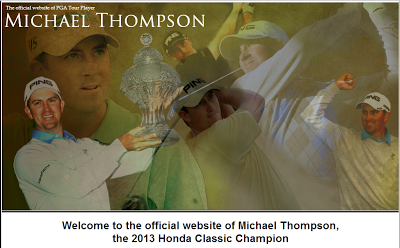 We encourage you to frequently visit both MichaelThompsonGolf.com AND ThompsonTide.com. Thompson Tide will continue on as a "fan site" providing online resources for following Michael's career on a per tournament basis and articles from our own personal points of view while MichaelThompsonGolf.com will provide "official" Michael Thompson news. 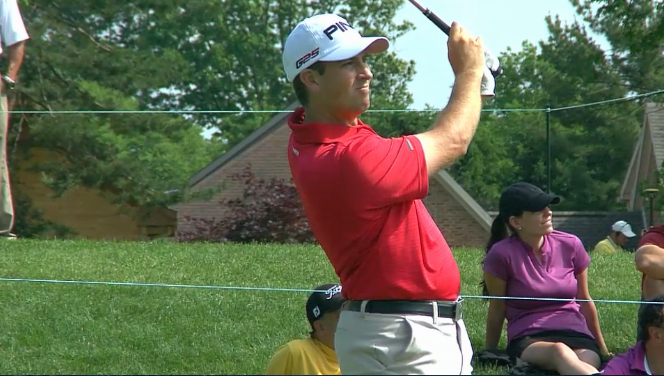 Michael Thompson's putter was downright cold during the first round of the Traveler's Championship. A strokes gained putting stat line of more than four shots lost to the field and a triple bogey resulted in a three over par 73 which left Michael in a tie for 122nd. The cut will be somewhere around par so Michael will be looking to put together a round in the 60's to make it to the weekend. Michael will once again be playing with Ian Poulter and Brian Gay. The group will tee off from the first hole at 7:49am ET. Michael Thompson returns to one of his favorite tournaments of the year, The Travelers Championship. The Travelers has been a special tournament for him ever since he was given a sponsor's exemption in 2008 to play as an amateur. In 2011, he placed 4th after finishing with a 62, which was the low round of the day. He'll no doubt be looking to build off that positive energy as he moves foward after a narrowly missed cut at the US Open. He'll be playing with Ian Poulter and Brian Gay, teeing off at 12:50pm. 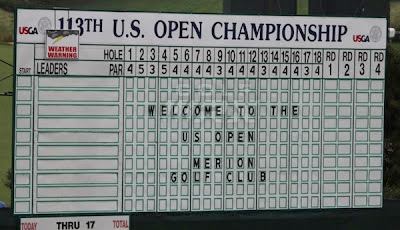 Michael Thompson's Friday at the US Open started off great but as the wind picked up, the East Course at Merion Golf Course chewed up and spit out many of the world's best golfers. Unfortunately, Michael was in that group. The day started well when Michael finished the last 9 holes of his first round at just 1 over par. At the time he was solidly inside the top 20. After a brief delay, Michael started his second round and after a chip in birdie on hole #3 he had reached even par and was tied for 7th. From that point on however, Michael's round was a struggle. He went four over par over the next three holes. As the round continued he was unable to find any more birdies and he recorded five more bogeys including bogeys at the final three holes. Michael had difficulty finding greens in regulation where he hit just 17 of 36. Michael is 9 over for the tournament which has him tied for 87th. Similar to yesterday, the afternoon golfers were unable to finish their second rounds so the cut is not finalized but it is projected to fall at +8. Michael was not alone in posting a high score this morning. Other top notch golfers had similar experiences. Players like Jim Furyk, Graeme McDowell, Keegam Bradley, and Zach Johnson will also miss the cut. 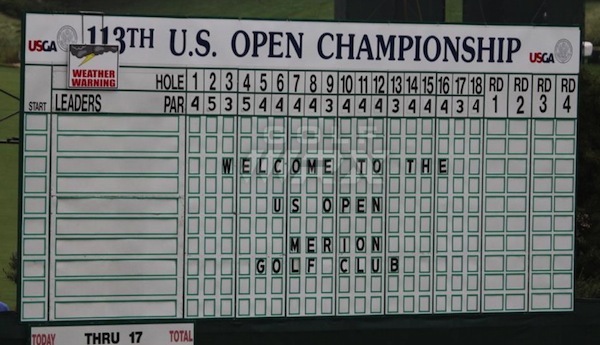 Bad weather in the Pennsylvania area caused two weather delays during the first round of the US Open at the Merion Golf Club and as a result, half the field will need to finish their rounds tomorrow morning. Michael Thompson is among those that are still in the middle of their first rounds. Michael is currently even par after his first 9 holes and he is sitting over a 2 1/2 foot par putt on the par 5 second hole. Even par has Michael sitting in a tie for 16th. The first round will continue tomorrow morning at 7:15am ET. Michael's second round is scheduled to start at 10:29am ET barring additional weather delays. The forecast for tomorrow calls for higher winds and more rain showers although the rain storms aren't expected to be as severe as today. The longer term forecast looks better for the weekend. Weather permitting, Michael is set to tee off at the US Open on thursday. Rain is expected to fall on the already soggy East Course at Merion Country Club outside of Philadelphia. If all goes as expected he'll be teeing off at 1:29 ET with Casey Wittenberg and Michael Weaver. One of the many clever groupings by the USGA, all three of them were US Amateur runner-ups. There is also an app for iPhone/iPad that you can download to follow the action. 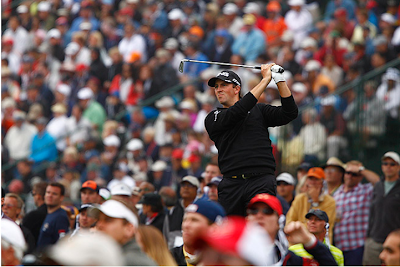 Michael Thompson tees off from the 18th hole during the 2012 US Open. Copyright USGA/Michael Cohen. Michael Thompson has always said he loves golf courses that play hard. He loves playing in the US Open which has traditionally been considered the most difficult test of golf. He likes it when par is considered a good score. The term "Michael Thompson Golf" has been thrown around and basically means playing to get on the green as fast as possible, making a few putts for birdie when the opportunities arise, embracing challenges, and always trying to have fun while you're doing it. Michael finished T2 at the US Open last year and he finished as the low amateur at the 2008 US Open which definitely shows that Michael not only enjoys difficult courses but he plays well on them. To underscore the fact, I ran across an interesting stat the other day that pretty much proves the point. There were several players who probably would have been high on this list but they didn't compete in one of the events (for example, Adam Scott and Matt Kuchar didn't play at the Honda Classic). So what's the point of all of this? Just this, Michael not only likes hard courses but he thrives on them. Bring on those difficult conditions at Merion!!! Michael finished strong at the Memorial Tournament completing the final round with 4 birdies offset by one bogey. His final round score of -3 left him at -4 overall, vaulting him twelve spots up the leaderboard into a five way tie for 8th. With a paycheck of just over $167,000 his 2013 earnings have now surpassed last year's total, officially making 2013 his best year on the PGA Tour. He moved up to 45th on the OWGR list, 22nd on the PGA Tour money list and 23rd on the FedEx Cup list. When it was all said and done, Alabama came away with their first national championship in golf. Congrats to Coach Seawell, the players and everyone else involved with the Alabama golf program. Well earned! The Memorial Tournament has been a test of patience during difficult weather conditions that have included high winds, rain, and weather delays. Friday's second round experienced a couple of delays because of dangerous thunderstorms rolling through Dublin, Ohio and was eventually postponed while over 40 golfers had not finished their rounds. Michael Thompson was one of those that had to come to the course earlier this morning to finish their second rounds. Michael finished his second round this morning with three pars but he struggled through the late afternoon storms on Friday and he posted a four over par 74. His strong first round on Thursday was more than enough to get him inside the cut line and Michael must have learned from Friday's conditions because even though the difficult conditions were still the same on Saturday, Michael was able to post a two under par 70 during the third round and he is now tied for 20th. He moved up 23 spots on the leaderboard. The weather forced the PGA to start Saturday's third round early and group players into threesomes while the utilized both the first and tenth tees to try and get the round in before more thunderstorms rolled through. This meant that all of the TV and streaming coverage was "tape delayed". They will utilize the same strategy for Sunday's third round when more severe weather is expected in the afternoon. Despite the difficult conditions that included greens running at 14+ on the Stimpmeter which might be the highest all year (including the majors), swirling winds gusting up to 35mph, and hole locations at the edge of small greens, Michael managed to make par or better on 17 of 18 holes during the third round. His lone blemish on the scorecard came when his tee shot found the water on the most difficult hole on the course - the par 3 16th which averaged more than a half shot over par and was the most difficult hole on the PGA Tour in 2012. He double bogeyed #16 but managed to make 4 birdies on the day and had several other birdie opportunities that just didn't fall. Michael's most unlikely birdie came on his last hole of the day, #9, when he chipped in for birdie from the rough 19 yards from the hole. The shot was an extremely difficult one as it was back towards the water and down a sharp slope. To give you an idea of the difficulty of the shot, Michael's two playing partners both bogeyed the hole with three putts coming from the same general direction as Michael's chip after their putts rolled down the hill significantly past the hole. 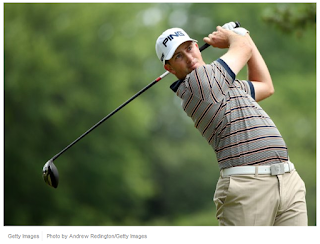 Michael will be playing the fourth round with Bo Van Pelt and Fred Couples. They tee off from the first hole at 11:40am ET.